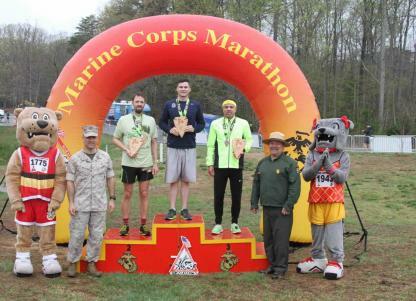 Runners will be required to pick up the official Marine Corps 17.75K bib with timing tag, the technical participant shirt and other materials prior to the start of the event. Runners must show the E-card at Packet Pick-up either printed out or displayed on phone. Proxy pick-up service is not available for this event. 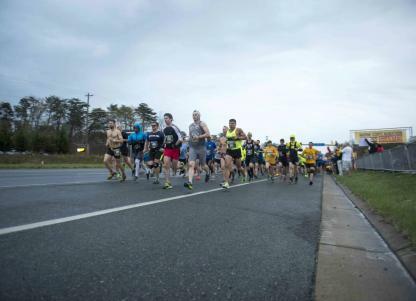 Packet Pick-up for Marine Corps 17.75K runners will be held on Thursday and Friday, March 26 and 27 from 10:00 a.m. - 6:00 p.m. at the VA Runner in Woodbridge, VA. Runners are encouraged to attend Packet Pick-up prior to event day. There will be limited event morning Packet Pick-up available at the event site beginning at 5:00 a.m. Runners must bring the official E-card and photo ID to Packet Pick-up. E-cards will be emailed prior to Packet Pick-up. Proxy pick-up service is not available for this event. Only the registered runner may pick up the official participant bib. Parents may sign waiver and retrieve packets for their children under 18 years of age.